Home / android / featured / minimilitia / vote / [VOTING CLOSED] - Are you looking for a no-root version of Toggle Mini Militia Mod app? 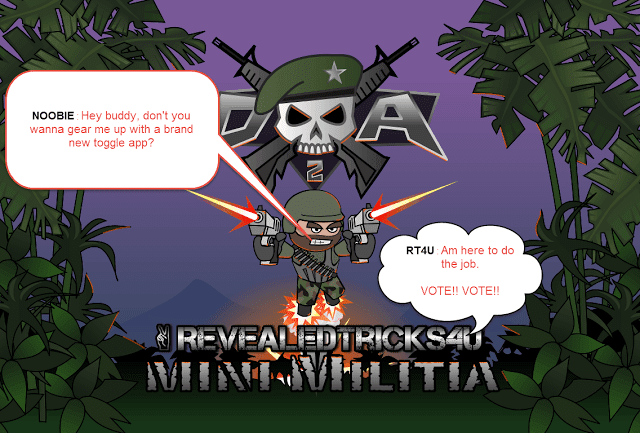 [VOTING CLOSED] - Are you looking for a no-root version of Toggle Mini Militia Mod app? It's a quick post regarding tons of emails, am receiving each and every day requesting for non-root version of Toggle Mod app for Mini Militia. So, I was wondering, for real how much of you guys really wanted a non-root version of the popular Mini Militia Toggle app. So I spent some time and created this poll form, with the help of poll maker. So guys, cast your votes and let me see the number of Yes'es, that really wants this to be done. NOTE - Please don't spam the comment box, just cast your votes and wait for the results. You could see the results, by clicking the Results button, now and then. POLL ENDS ON JUNE 30, 2016 (Around 5:30 PM). I will end this poll as soon as it reaches at least 200 number of Yes'es. Start casting your votes lads. The more number of Yes'es = The more steps closer towards getting the job done. Though I have a rooted device and I loved your work but still I want a non rooted version so that everyone can enjoy your work ! Actually you are more awesome than the game itself because you MOD it. It's a big YES for the non-rooted version of the app !